Tesco’s day four: three ways to bake eggs | WTF Do I Eat Tonight? Eggs are the ultimate fast food: who hasn’t knocked up an omelette or scrambled/poached/fried some when inspiration is lacking? And, regardless of where you shop for food, they’re likely to stock them. But, useful as they are, they can also be a bit, well, boring. I love an omelette but when it’s all I can think of, rather than what I want, it feels like fuel not food. However, with a little bit of imagination, a couple of shallow ovenproof dishes (ramekins are best, but larger ones are good if you’re making eggs for more than one person) and not much more time than it takes to knock up some scramblers, you can turn eggs into oeufs en cocotte. Sounds so much grander than baked eggs doesn’t it? 2. 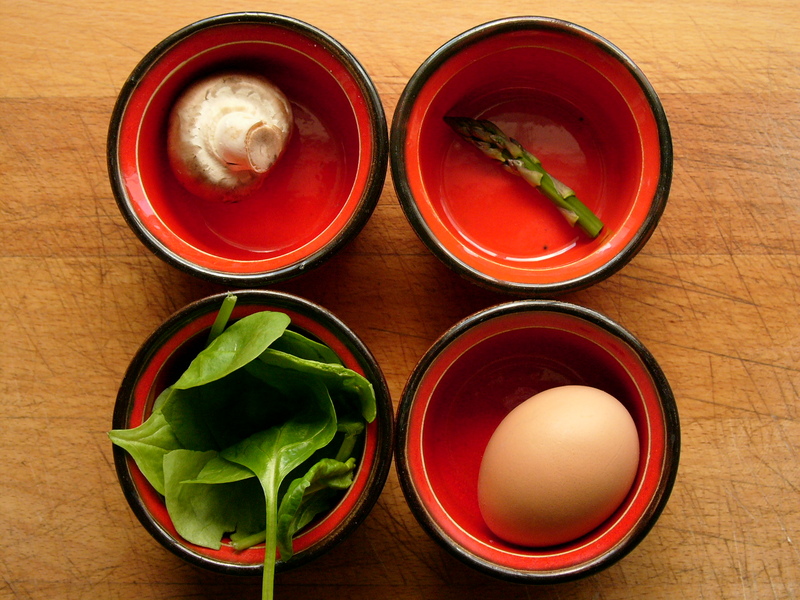 For a spinach baked egg, steam 50g of spinach until soft then squeeze out any excess water. Gently heat a good tablespoon of crème fraîche in a shallow pan or frying pan, add the spinach, season (don’t add too much salt; it’s easy to overdo it with these) and, if you like, add or grate a little nutmeg into the sauce. When the spinach and cream are combined, put the spinach in the bottom of a ramekin, keeping back a little of the creamy sauce, put an egg on top, pour over the rest of the cream then bake for 10 mins or so until just set (or a little longer if you want a hard egg). 3. For an asparagus baked egg, steam 50g of asparagus tips (about 5 or 6) until just cooked then place in the bottom of a ramekin. Gently heat a good tablespoon of crème fraîche in a shallow pan or frying pan and when warm and bubbling pour half of it over the asparagus tips. Break the egg into the ramekin, pour over the other half of the cream, season and bake for about 10 minutes until just set (or a little longer if you want a hard egg). 4. Finally, for a mushroom baked egg, slice 2-3 mushrooms and sauté them with a knob of butter in a small frying pan. Add a good tablespoon of crème fraîche, season then tip the mushrooms into the ramekin, keeping back a little bit of the creamy sauce. Break an egg on top of the mushrooms, pour in the rest of the creamy sauce and bake for about 10 minutes until just set (or a little longer if you want a hard egg). This entry was posted in Asparagus recipes, Fast food fixes, Gluten-free, Spring vegetable recipes, Summer recipes, Vegetarian recipes, Wheat-free and tagged egg recipes, fast food recipes, quick and easy recipes. Bookmark the permalink.